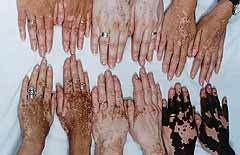 Vitiligo is a peculiar condition which causes the de-pigmentation of the skin. Its distinct characteristic is the presence of white patches on the body. Considering the fact that this type of skin condition is present across the world, and about three percent of the world population has been affected by it, the real cause is still unknown and there is no known cure for it yet. People with Vitiligo can manage their condition by making lifestyle and diet changes, increasing their intake of vitamins A and B and using sunscreen every day. Vitiligo patches tend to burn quite easily so it is very important to protect them from the harmful rays of the sun and sufferers should always wear ahigh factor sunscreen every day, regardless of the weather. The problem with high factor sunscreens is that they are often thick, sticky creams that leave a greasy residue on the skin. This makes them uncomfortable to wear and Vitiligo sufferers end up trying to avoid the sun at all costs or risk getting burnt because they can’t find a good quality, easy to use sunscreen to protect the delicate patches of skin that have lost pigmentation. However, there is a sun protection on the market that is comfortable and easy to wear, every single day of the year and that is Techniblock SPF50+ Sun Spray. Techniblock was introduced to the UK in 2009, following it's discovery by us in South Africa, and is not available in High Street shops. Techniblock Suncare UK has sole distribution rights and sell online only. Techniblock was developed by a South African pharmaceutical company, Technikon Laboratories, and is imported into the UK by Techniblock Suncare UK. The sun spray does not contain lanolin, oils or emulsifiers, but is delivered onto the skin in a clear spray that dries instantly. Once dry, it does not even feel like you are wearing sun protection. Techniblock is extremely water and sweat resistant, providing long lasting sun protection. It is also formally recognised by South Africa’s cancer association, CANSA, as an effective barrier against the harmful UVA rays that cause skin cancer. Some Vitiligo suffers might be tempted to use sunbeds or sunbathe to add colour to their skin but patches of skin that have lost pigment burn extremely easily and so it is vitally important that daily sunscreen is used. Techniblock SPF50+ Sun Spray can be applied first thing in the morning and will keep you protected for over 6 hours, even in extreme temperatures. If you are a Vitiligo sufferer and have tried all day sunscreens like P20 and Ultrasun, you will be impressed with Techniblock. One quick spray and you can go about your day safe in the knowledge that you are protecting the delicate patches of skin that have lost pigmentation.